My friends M&M invited me over to make pizza last night. I got them hooked on home pizza making with the dough from Trader Joe’s. 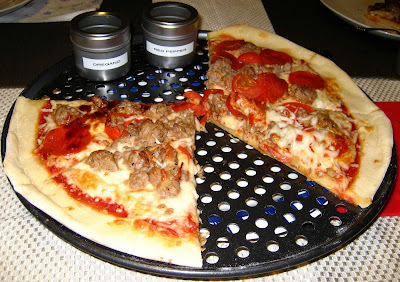 They have a fancy pizza pan with holes, see? Ooh la la. The dough doesn’t stick at all and it stays nice and doughy, not crunchy. We had pepperoni and sauage and cherry tomatoes. The sausage was fresh from TJ’s and we cooked it up a little before using it as pizza topping. It turned out great. I put some bbq sauce on mine after it was cooked and it was even tastier. 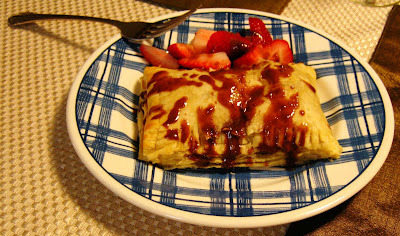 M made some dessert as well, some chocolate pastry pockets. She got the recipe from Paula Deen. She even made crimps on the edges with a fork. Isn’t it fancy? She made some chocolate sauce with cream and Hershey’s Kisses as a topping and also sliced up some strawberries. It was so simple, but so tasty. We also had some white bean dip as an appetizer that was good and pretty much tasted like hummus, but slightly different. We were kicking it like royalty in Ardmore.